Dallas chapels typically have smaller budgets to work with especially when it comes to security. Even though security systems and cameras do offer a great deal of safety, there are some occasions and threats that can’t be addressed with these measures. When it comes to larger, imminent threats that chapels have unfortunately become a target for, it is vital to find comprehensive solutions that can actually save lives and defend your flock. Safety and security window film offers the protection that your congregation deserves at an affordable price. Security film protects any exposed glass doors or windows that may play a role in safety risks as well as used as an access point for assailants and burglars. Safety and security window film prevents broken glass hazards from harming your congregation– broken glass is actually the leading cause of blast-related death and serious injury. By keeping broken glass fragments together within the window frame, your church will be protected from natural disasters, break-ins, robberies, freak accidents, and more. For more severe threats like mass shootings and explosions, specialty security film systems are available. These specialty security systems better absorb the shockwaves caused by these even higher impact events. Safety and security film can even be installed over stained glass that has reinforcement glass. 3M™ Safety & Security Film S140 Demonstration for Dallas Chapels from Kansas City Green Window Film on Vimeo. GreenLight Window Films is proud to provide on-site consultations to better help your chapel find the right security option. Security evaluations offer an in-depth evaluation of your property, helping find vulnerabilities and strategic placement for specialty security films. Our security team can offer the best recommendations based off analysis and property visit, while working to stay within your budget. 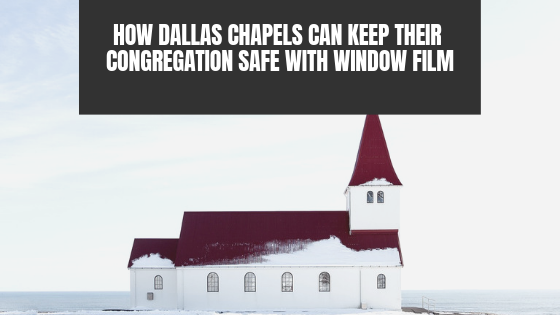 For more information regarding safety and security window film for your Dallas chapel, please contact us!